A cure for diabetes could be a step closer after scientists found cells from the spleen can transform into insulin-producing cells. US researchers were able to halt, and even reverse, the disease in mice. The research offers hope to people with Type 1 diabetes who need insulin injections to survive. The team from Massachusetts General Hospital, whose announcement coincided with World Diabetes Day on Friday, hope to begin human trials soon. Type 1 diabetes affects around 350,000 people in the UK. People with the condition do not produce insulin, needed to convert sugar into fuel and normally produced in the pancreas in cells called islet cells. Their islet cells are destroyed by the body's own immune system, leading to sugar building up dangerously in the blood. The US researchers had already shown that injecting diabetic mice with spleen cells from healthy mice re-educated their immune systems so that they could accept an islet cell transplant. But the mice unexpectedly began producing islet cells that could secrete insulin themselves. This latest research found this only happened if the mice had been given a specific type of spleen cell. They can be distinguished from other spleen cells because they lack a particular molecule called CD45. Scientists had believed it was impossible to regenerate insulin-secreting islet cells. To double-check their findings, researchers carried out the same treatment, giving female diabetic mice spleen cells from healthy male cells. They found that in diabetic mice that achieved long-term normal glucose metabolism, all of the new functioning islets had significant numbers of cells with Y chromosomes, showing they had come from the male donors. In a further experiment, donor spleen cells were marked with a fluorescent green protein, and again these cells were found throughout the newly developed islets. Denis Faustman, director of the Massachusetts General Hospital Immunobiology Laboratory who led the research, said: "It's the cells without CD45 that are the precursors for pancreatic islets. They have a distinct function that has not previously been identified for the spleen." Dr David Nathan, director of the hospital's Diabetes Center, added: "These exciting findings in a mouse model of Type 1 diabetes suggest that patients who are developing this disease could be rescued from further destruction of their insulin-producing cells. "In addition, patients with fully established diabetes possibly could have their diabetes reversed." Dr Eleanor Kennedy, research director for Diabetes UK , said "The initial results of this research are potentially very exciting for people with diabetes. Reversing the onset of Type 1 diabetes by turning adult precursor cells from the spleen into insulin-producing cells is a new approach. 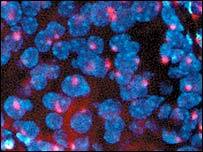 "Previously research has concentrated on embryonic stem cells. This new breakthrough reopens the debate on what other types of cells are capable of. This research is in the very early stages and a lot more work still needs to be done. "Diabetes UK will be watching the progress with interest."